After qualifying 7th of the 10 paddlers to contest the final, Liam was aiming to improve on his 9th placing in this event in 2016 and did just that, putting in a great run to take 5th place in a race won by local paddler Marko Mirgorodsky, with Czech paddler Vaclav Chaloupka taking Silver and the German Florian Breuer taking Bronze. This is a super result for Liam who was out of his C1 due to injury for most of the winter and since his hip surgery at the end of March, after which he underwent a long and painful period of rehabilitation, only getting back to competition for the second race of the senior World Cup series in Augsburg just a month ago. Well done Liam and to all of the Irish team paddlers who gave us such good individual performances over the past week. Tomorrow, the Championships conclude with the team races with Sam Curtis, Eoin Teague and Oisin Farrell in K1M off at 09.52 Irish time and Liam Jegou, Jake Cochrane and Robert Hendrick in C1M off at 14.09. Good luck guys! U23 & Junior World Championships C1 Semi Finals and Liam Jegou heading into finals this afternoon!!! 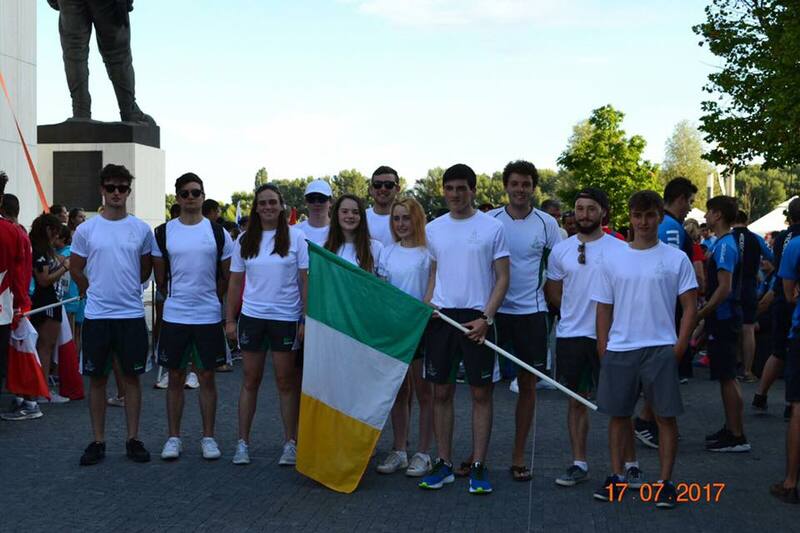 This morning’s programme at the Jun/U23 Slalom World Championships in Bratislava, Slovakia saw the Irish team competing in the semi-finals of the C1M U23 and Junior classes. Jake Cochrane was first-off, of the Irish U23 trio, on a very tight technical course. He lost a little time on gate 3, picking up a penalty in the process and shaved it a little tight on two following offset moves to pick up further touches on gates 8 and 13 to leave him in 23rd position overall of the 62 competitors in this class with a time of 107.55 plus six added penalties. Robert Hendrick was next off and he put in a very controlled, penalty-free run of 109.06secs to finish up in 20th position overall. Liam Jegou knew he had to put in a top ten performance to progress to this afternoon’s final and he put in a very solid, penalty-free run of 100.41secs to qualify in 7th position. So, one of our three U23 semi-finalists progress to the finals this afternoon. In the C1M Junior class James Gibbons was next up and was going well and clear up to gate 14 but was off-line for the following very difficult offset sequence and missed gates 15 and 16. Despite going back for the gates, he lost at least 30secs and took 50’s on both which ended his challenge. Still a very good debut at this level of competition for this young paddler which he will be hoping to build on at next month’s European Championships. Only a limited number of places left on our next Code of Ethics Basic Awareness Course on Monday, 14th August from 6.30pm to 9.30pm in Tallaght Leisure Centre. Followed by our Safeguarding 2 – Children’s Officer Workshop on Wednesday, 20th September from 6.30pm to 9.30pm in Clondalkin Leisure Centre. The cost of each course is €15 per participant and booking is essential. To book a place on this course please email traceykelly@sdublincoco.ie for a registration form or call 01 4149270. 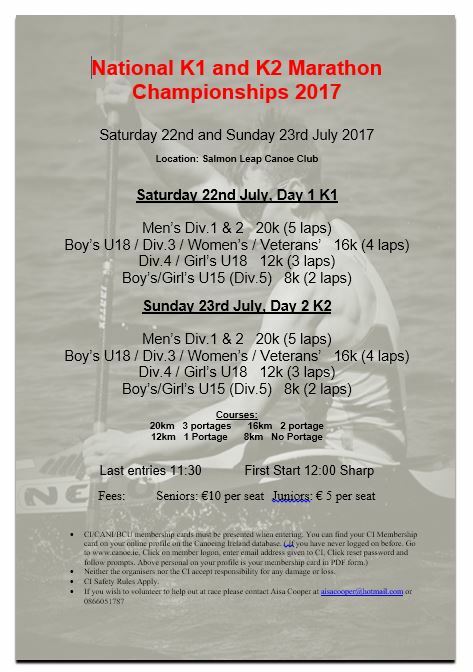 Please fill in our review of Club champs 2017. This information will help us improve, modify and inform Canoeing Ireland of how we can better our events and serve the membership in a more useful and productive manner. It was a day of mixed fortunes today for the Irish team in the K1M and C1W heats of the Jun/U23 Slalom World Championships in Bratislava, Slovakia. On her first run, Caoimhe O’Ferrall, in C1W U23, fell foul of the big “Niagra” drop at the end of the course resulting in a capsize on the way into upstream 21 and picking up 50’s on the last three gates. Her second run was better but four penalties for two touches put her two places off the group of 30 paddlers who progress to the semi-final over both runs. In the K1M U23 first run, Sam Curtis’s time of 95.47secs (without the two touches he incurred) would have put him just 0.11secs off making the top 30 to qualify direct to the semi-final from run 1. Eoin Teague and Oisin Farrell had slower times and picked up penalty touches to put them five and seven places respectively behind Sam. In second runs, Eoin was best of the Irish with a time of 94.88secs which would have put him 0.97secs off the top ten progressing to the semis, but he also picked up one touch which placed him seven places off the cut. Sam was two places behind Eoin, also with a touch and 0.23secs behind on time. Oisin had a nightmare time in negotiating upstream gates 14, 17 and 21 and picked up two touches which put him further down the field. So unfortunately, no progression to the semis in K1M U23. In the afternoon, it was the turn of Louis Hannon in K1M Junior, making his debut at this level of competition. And what a debut it was! In his first run, Louis put in a very controlled and impressive run of 106.12 secs with the addition of six penalties for three gate touches, which left him in 36th place in the field of 81 competitors and just 6 places and 5.95secs off direct qualification for the semi-finals. A brilliant result for such a young paddler in his first outing at this level of competition. Needing a top ten position in the second run to progress, Louis dug deep and again put in a great performance in a time of 98.99secs, shaving more than seven secs off his first run time, but picking up four penalties for two touches in the first third of the course. With six paddlers left to run, he was “on the bubble” in 10th position but unfortunately was overtaken by three of those paddlers. Nonetheless, it was an excellent, mature performance by such a young paddler at the start of what promises to be a great paddling career ahead. His second run result would have put him in 26th position in Heat 1 and directly into the semi-final in the first run of his first outing at this level. Well done Louis and congratulations also to proud Dad Stephen who is serving as Team Manager for the event. Mens C1 Makes Irish Canoe Slalom History! Terrific results for the Irish team in the heats of the Jun/U23 Slalom World Championships which started today in Bratislava, Slovakia. In C1M U23, Liam Jegou in only his third competitive outing following his lay-off for hip surgery in March, put in a fast and clean run of 98.83secs in Heat 1 to finish 8th of the 20 paddlers to progress direct to the semi-finals on Friday morning. Then came Robert Hendrick who put in a super clean run of 102.57secs to take 15th place and qualify direct. Jake Cochrane made an error half-way down the course on his first run which saw him miss an upstream gate and put him well outside the cut. So as one of the remaining 42 paddlers, Jake went into the second run knowing he had to make top ten to progress to the semis, a very high-pressure situation for him. He rose to the occasion and put in a very solid clean run of 102.25secs to take 8th position and earn his place in the semis. 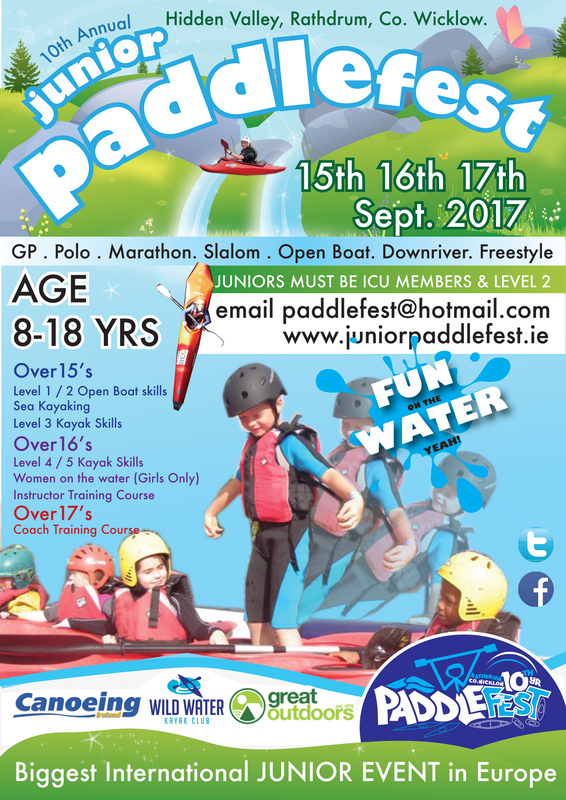 In the C1M Junior class we fielded two paddlers who were making their debut at this level of competition – James Gibbons and Sean McLarnon. In their first run, both paddlers missed gates on the end section of this very difficult course and put themselves under pressure to make top ten of the remaining 30 paddlers in the second run. James put in a very good performance to finish in 7th place and book his place in Friday’s semi-final. It was not to be for Sean who again had major difficulties on the bottom section of the course and unfortunately did not progress beyond the heats. Sean has this experience in the bank now for the next few years of participation. So, all three Irish U23’s in the 30-boat field for Friday’s semis and they are joined by James Gibbons in the Junior semis. A terrific and historic result for an Irish team. One which showcases the strength of C1 paddling in Ireland and bodes well for the future. 2017 World Championships Mens C1 off with a Bang! U 23 –Liam Jegou, Robert Hendrick, Jake Cochrane and Junior James Gibbons for making Semis in today Mens C1 event! Tomorrow more racing… Mens K1 and Womens C1! Good luck to all! Best of Luck to our 2017 Canoe Slalom Junior & U 23 Team! Neither the organisers nor the CI accept responsibility for any damage or loss.